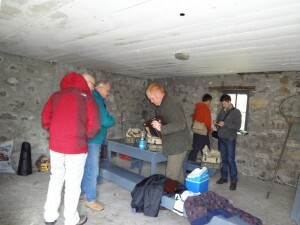 Each day after breakfast, there would be a most amazing spread of sandwich materials in the Picnic Room. If we were going out for the day, we’d stop in there and pack up a lunch then head out. 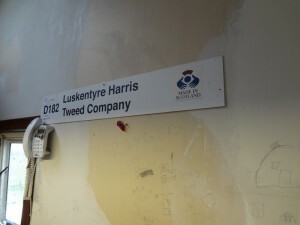 The second day, the weather was absolutely nuts, so instead of going out to hunt or fish, most of us decided to go visit a crofter and see how the Harris Tweed is manufactured. 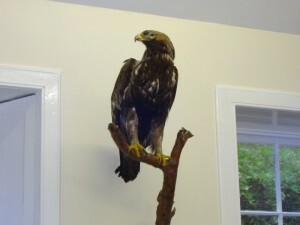 This golden eagle presides over the Picnic Room, along with his friend the stag and more than a few racks of antlers. Another feature of the Picnic Room was the drying closet. This was essentially three or four racks that slid out of the wall and you’d put your wet gear there after coming in from stalking or fishing. Genius, and oh-so-necessary, because the wind and the rain were fairly constant and immense at times. 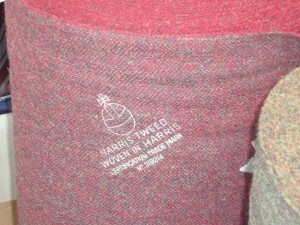 If you know anything about certain segments of fashionable clothing, you are aware of the Harris Tweed. It has been called “The Champagne of Fabrics” and is the only fabric in the world governed by its own Act of Parliament. Dan Brown name-checks it in The Da Vinci Code (and his other books featuring Robert Langdon) as the jacket of choice for his main character. Jasper Fforde (one of my favorite authors) even has a character named Harris Tweed who appears in the Thursday Next series. If you haven’t read them, you really should. The tweed is hand-woven by individual artisans, and traditionally uses colors and dyes sourced from the island. It’s gorgeous, surprisingly soft, versatile, and incredibly durable. The Wikipedia entry is fairly detailed and mentions one Mr. Donald John Mackay, pictured below. Donald John welcomed 8 or so of us into his tiny (roughly 8 feet by 12 feet) crofter’s hut and we all braved amazingly strong wind and rain to get there (Innes drove us) and huddle around his loom. 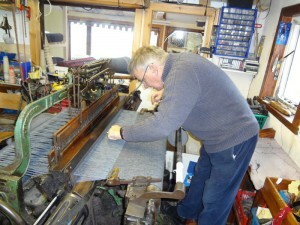 He showed us the threads and explained his process, then wove a few inches to show us how it’s done. 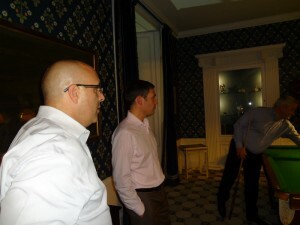 It was utterly fascinating to a fiber nerd such as myself and I honestly could have sat and watched him all day long. He said it takes about a full day to set up the loom (something like 696 individually hand-tied knots) and then about a week to weave 90 meters or so. The amount of skill and care that goes into his work is really astounding. 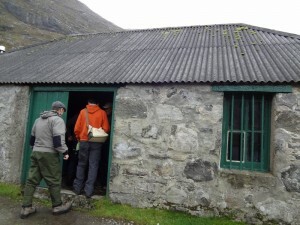 The other half of the crofter’s hut was a combination shop/storeroom (again, maybe 8 by 12 feet), and since this is about as close to ‘buying locally’ as I am ever likely to get when it comes to cloth, of course we all bought some. I mean, I literally bought this cloth from the hands that made it. Apparently, it’s 4 meters for a man’s jacket and 3 meters for trousers. Almost all the boys bought enough for a jacket, and in a weird (but not at all surprising) twist, they all bought the same pattern. 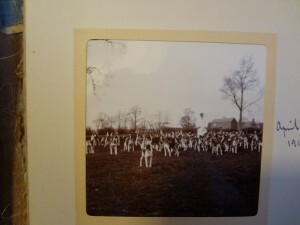 Thus the Tweed Army was born. When everyone gets around to having their jackets made, we’re going to have a dinner and take hilarious pictures. 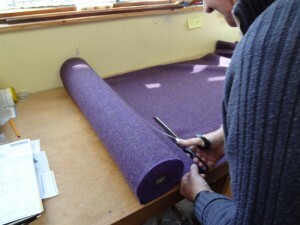 I bought 3 meters of a captivating purple tweed, but I am not yet 100% sure what I’m going to do with it. I may have a skirt made, or I might do a shawl/wrap with 2 meters and I had an inspiration for the remaining meter, but I am loath to actually cut into the fabric myself. It would make me sad if I messed it up. We shall see what I end up doing with it. 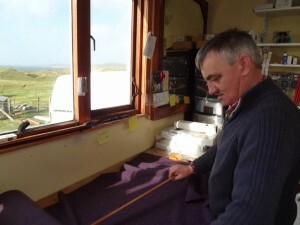 Donald John measuring my tweed. Measure twice, cut once! Cutting my tweed. Those shears were like two swords. Once the tweed is woven, it is picked up by the Harris Tweed Authority for finishing and inspection to ensure it meets standards. 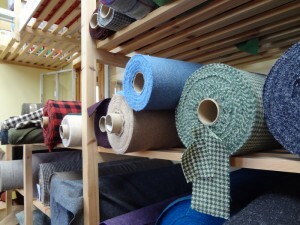 Not just any tweed gets to be Harris Tweed, you see. If the roll meets specifications and standards, it is stamped with the Orb, which is one of the most recognized trademarks in fashion. British designer Vivienne Westwood’s brand logo is very similar to the Orb, which makes sense because she is a big fan of the Harris Tweed. 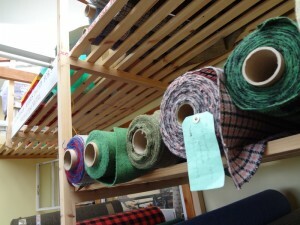 The Orb stamp on a finished roll of Harris Tweed. Even Nike got in on the act at one point. They released a series of throwback sneakers made with Harris Tweed woven by none other than Donald John Mackay. 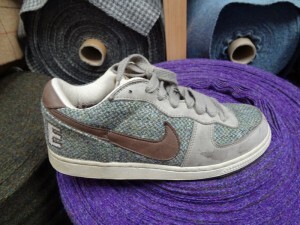 A quick Google search tells me that various Harris Tweed Nikes are going for at least $80 on Ebay, if you want some. Once everyone was satisfied with the miles of tweed they’d purchased, we left Donald John to his loom and headed back toward the castle. We’d decided earlier to have lunch at “The Hut” which is exactly what it sounds like. 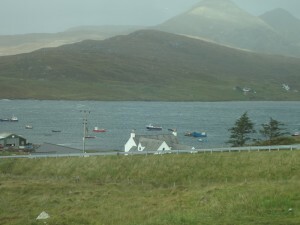 It’s a hut alongside a road that leads to three different lochs for fishing and more than a few different areas for stalking. I believe the hut predates the castle itself, and it’s nothing more than a rough stone building with a roof on it. There’s a small stove inside and a table with benches but as far as comfort goes, that’s about it. Another view from the road. It looks like this every way you turn your head. 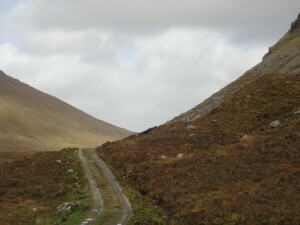 The road, if it can rightly be called that, was a one-lane, bumpy affair. In fact, the big van we’d been riding around it couldn’t handle the terrain so we had to switch to the vehicles that could handle it, namely a Mazda something-or-other and a Range Rover. 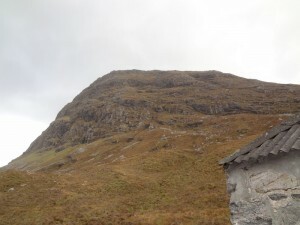 We bumped and squelched our way along the road for a good ten minutes before coming in sight of the hut. Later, we looked at a map of the estate and the road goes on a fair way farther, each mile bumpier and squelchier than the last. You know this is my kind of trip when “packing a lunch” includes at least four bottles of wine. Mr. Hall appeared later on, carrying what looked like a fat briefcase but opened up to reveal two bottles of whisky and four glasses inside. That man is pretty much a walking party, it seems. It’s evident that this is very much a man’s sort of estate, because restroom facilities were non-existent out there. I think so, anyway. I didn’t get a chance to ask anyone who might know. 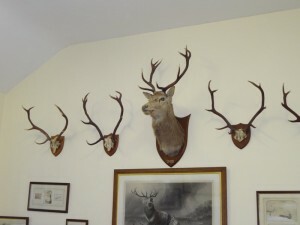 The estate used to house a great number of dogs used in stalking the deer. 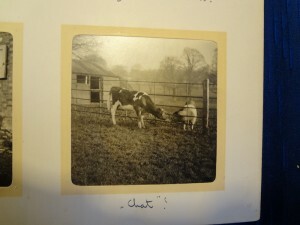 This is one of the photos in the albums kept by Lady Sophie Scott, who was a resident of the castle around the turn of the 20th century. She was an avid sportswoman and photographer, and her albums give us a very intimate look into her life and loves. This is my favorite of all the photos in Lady Sophie’s albums, and I don’t think it’s even from Amhuinnsuidhe. I just thought it was cute, with the caption “Chat!” That is precisely how I would have captioned it. 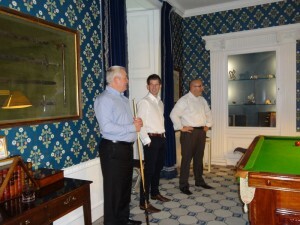 This is a display case in the Snooker Room (yes, we spent a great deal of time in there). 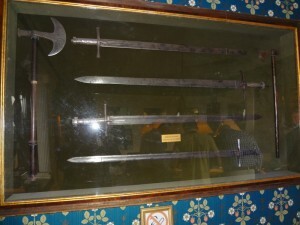 The plaque inside reads “Weapons Taken From A Warrior In The Sudan” but unfortunately it’s not dated. 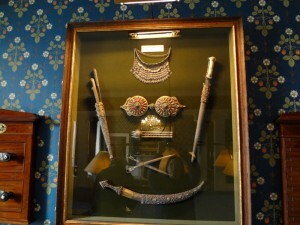 Weapons and regalia taken from a dervish. 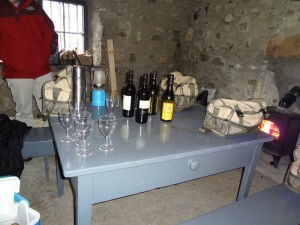 The castle understandably requires a great deal of provisions to keep itself going. 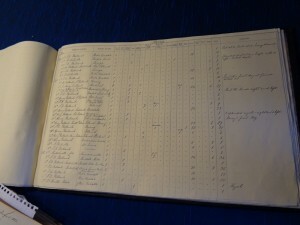 The nearest town is at least a half-hour away by car NOW, so imagine 150 years ago. 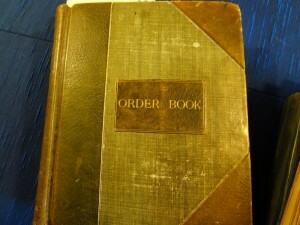 The Order Book was a listing of all the things that were ordered by the castle, and gives a really interesting look at the things they needed through the years. 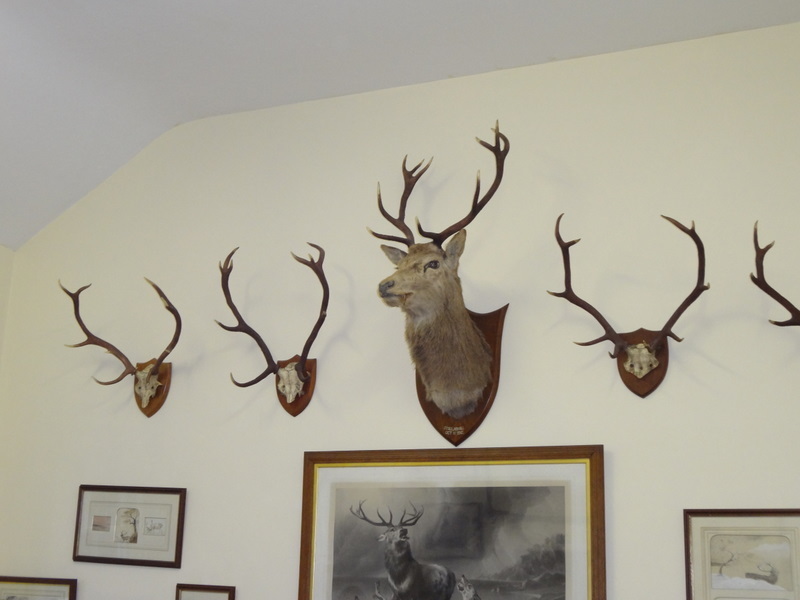 The years between 1914 and 1918 are missing, presumably because Great Britain was enmeshed in World War I and needed all her men at the front, not rushing off to their country estates to shoot stag. 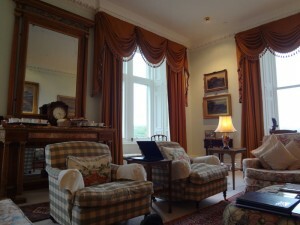 This is an okay shot of the Drawing Room. Every day around 4, tea would be served. People would wander in from their various pursuits to have tea and chat. It was one of the few times each day that anyone really contacted the outside world. Some of the men were working here and there throughout the day, but teatime was really the only time someone would pull up Yahoo News or similar on the iPad and see what was going on, check baseball scores, etc. It’s a cozy room with comfy furniture, and I spent quite a few happy hours in there just reading and being quiet, which is something I never ever get to do at home. The light was fantastic and it had amazing views of the sea. 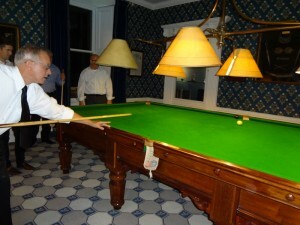 Again with the snooker. I am sorely tempted to jettison my dining room set and put in a pool table, but Freddie is against this plan. It was mostly the men who were playing, because I am actually terrible at it. I made a couple of really spectacular shots, though. One of them was even the shot I meant to make in the first place. Mostly, I watched and heckled and chatted with whomever else wasn’t playing. I wish these photos were bigger because there is nothing I love more in this life than hanging out with good-looking, well-dressed men, and I got to do that EVERY NIGHT. Alas, WordPress gives me “medium” and “freaking humungous” as photo sizes. Oh well.